I thought I would get a chance to make a happy Friday post earlier in the day but alas today has had me going nonstop. It all began at 5:30 am, a time of morning I am not very fond of as I am not a morning person. I've done myself a great favor by teaching my son how great sleeping in is, he generally gives me until 8 to catch my Zzzzzs since I am quite a bit of a night owl. So yes, 5:30 to take my husband to work, big yawn. We are currently a one car household, it worked for us in the past, when he worked nights, but now it is a bit of a pain with him on days. If I want the car I must get up and take him to work, trust me, I plan to change this situation very soon. After I dropped him off, I managed to catch a small nap while the kiddo indulged in some Angry Birds Go! And yes, I am admitting that I let the iPad babysit this morning, I haven't any shame. And then it was off to the showers for both of us. Freshly showered and dressed we embarked on our day of groceries, oil changes, a little shopping for fun and for gardening, and more errands than I really care to count for this weekend. I didn't even managed to complete my tasks before picking my husband back up and dropping my son off for his overnight stay with Grandma. So, I whisked my husband along for the final groceries and a Target trip. During which trip he treated me to a new swimsuit (He's so amazing) that I won't get to wear for another month or so. Afterwards he convinced me to pick up a few movies to rent, which puts me where I am currently, watching The Hobbit: The Desolation of Smaug. While I'm waiting for dinner to cook, roast chicken and veggies, I get the opportunity to sit here and geek out a bit! Yay, geeky me. I fell in love with Tolkien's books when I was a teenager, though I never became near geeky enough to speak elvish, I have read them a few times over. So when the Hobbit movies finally came out, you can bet your chickens I was excited. We haven't bought The Desolation of Smaug yet because I insist on waiting for the extended edition. Why the extended edition? Because they're soooo special and have all the little geeky goodies that make my heart go pitter patter. For example in the extended edition of The Hobbit: An Unexpected Journey there is an amazing scene in Rivendale with Bofur (James Nesbitt) singing a dwarfish song, dancing on a table, kicking food around while the other dwarves throw food. The looks on the elves faces are priceless as Gandalf is completely unfazed by the dwarvish culture, it's clearly far removed from the sophicates elves. It's the little details that make me smile, I suppose. Just as with the Desolation of Smaug, I accidentally picked a showtime for a 3D showing. I really don't like 3D, but this is the special effect intensive movie that really is worth it. So we watched in it 3D and you can bet something got me. I may have let out a little scream when the first spider showed up. I don't know if it was really because the appearance of the spider startled me or just the fact that I hate spiders and upon seeing a giant 3D spider, I was momentarily terrified. Either way, my husband was laughing and I am comfortable enough in my own skin, to laugh at myself. Plus, the arrival of the new, improved Legolas was welcome consolation. I say "new, improved" because I'm of the opinion that Orlando Bloom is like a fine wine, he's improved with age. I mean, he was fine in the LOTR days but aging a little has done him well. Mmm hmm. Pardon me, I've always been an elf fan girl. And with the chicken fresh out of the oven, much later than I anticipated, I bid you a good evening! 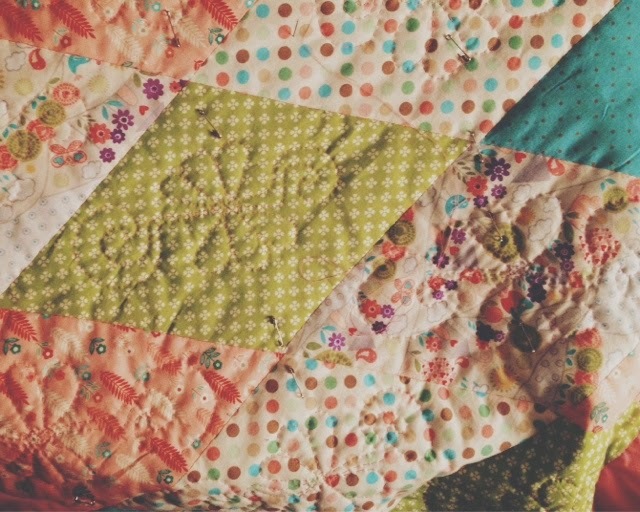 I'm off to eat, enjoy my movie and continue working on that beautiful quilt pictured above. Happy Friday evening and Happy Easter, folks!